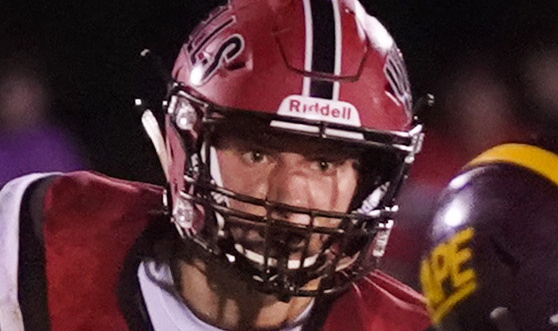 The Gaziano linemen dinner is Saturday and a Fitzpatrick Trophy winner will be named Sunday. Wells High senior Tyler Bridge admits he increasingly has caught himself thinking about what it would mean to win the Fitzpatrick Trophy. The Fitzpatrick Trophy and Gaziano Awards – Maine’s biggest individual high school football awards – will be announced this weekend. On Saturday, the linemen will be in the spotlight at the Frank J. Gaziano Memorial Offensive and Defensive Lineman Awards dinner at the Augusta Civic Center. The offensive line candidates are Chase Lamontagne of Kennebunk, Aidan McGlone of Bonny Eagle and Zachary Reed of Scarborough. The defensive lineman finalists are Cole Melanson of Leavitt, Nic Mills of Cony and Thomas Palmer of Thornton Academy. The Gaziano winners each receive a $5,000 scholarship. Delayed a week by a snowstorm, the 48th James J. Fitzpatrick Award dinner will be held at noon Sunday at the Holiday Inn By the Bay in Portland. 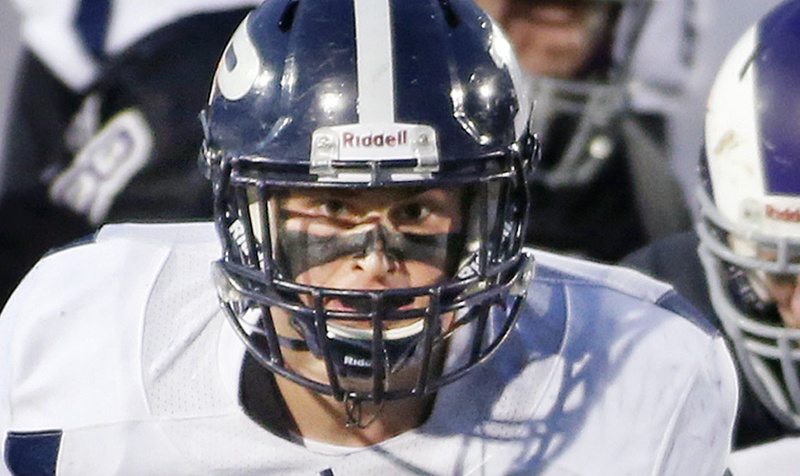 The trophy goes annually to the top senior in Maine high school football. Bridge will be joined by Fitzpatrick finalists Anthony Bracamonte of Thornton Academy and Zack Elowitch of Portland. All three were Maine Sunday Telegram All-State picks. “I’ve seen some highlights and they’re both deserving. To be on the list in the first place is pretty cool,” said Bridge, who rushed for nearly 2,400 yards, set an unofficial Maine single-season record by scoring 45 touchdowns, and led Wells to a 12-0 championship season. Bracamonte gained 2,137 all-purpose yards and scored 27 touchdowns, leading Thornton to the Class A state title and its first unbeaten season since 1986. He rushed for 1,037 yards with 578 yards receiving, and 546 and seven touchdowns on punt and kick returns, earning the Gatorade Maine Player of the Year. In his final six games he averaged 250 all-purpose yards, capped with scintillating efforts in the regional final against Scarborough (300 yards and 3 TDs rushing, kick return TD) and state final against Portland (4 TDs, 100 yards rushing, 144 receiving). Bracamonte intends to play in college and is “leaning” toward either Endicott or Bates, Kezal said. Elowitch also showed his ability in the state final, rushing for 244 yards and scoring both Portland touchdowns on 66- and 67-yard runs. Including Portland’s win against Deering in the annual Thanksgiving game, Elowitch rushed for 2,162 yards and 26 touchdowns, both Portland High records. Bridge ran for a school-record 2,390 yards and 43 TDs. He also returned two kicks for scores, totaled 3,055 all-purpose yards and threw two touchdown passes. 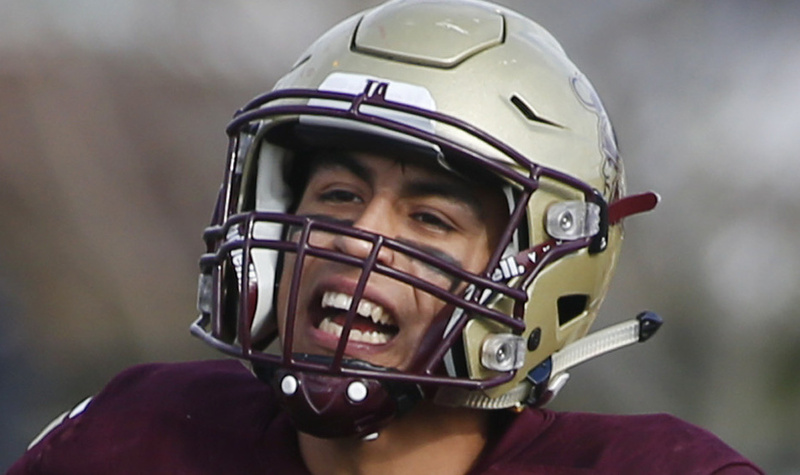 In Wells’ Class D championship win he rushed for 206 yards and five scores, and threw a TD pass. It was in Wells’ closest game of the year, a 26-20 road win against Spruce Mountain, that Bridge turned in what Wells Coach Tim Roche thought was his defining run, a 30-yard touchdown for the eventual winning points. Bridge will have to cut short an official recruiting visit to the University of New Hampshire to attend the Fitzpatrick dinner. Bates, Bowdoin, Colby and Bentley are among other suitors. “It will be an eventful weekend,” Bridge said.